Imdaad is a leading provider of integrated building management services in the United Arab Emirates (UAE), supporting over 1,000 of the most important buildings in Dubai. In 2014, the company entered into a partnership with Slovenian company Robotina d.o.o. to carry out an ambitious project of establishing the Network Operations System (NOC), which would enable a remote control and management of buildings, contributing to greater energy savings, lower operational costs, and increased energy efficiency. The project supports the UAE vision of developing “green” sustainable living solutions and turning Dubai into a “smart” city. All data collection and monitoring procedures in the NOC are carried out using the ICONICS products, while the integrated management of assets and services is performed using the IBM Maximo Asset Management information system. The challenge lies in the integration of these two systems. 3 PORT d.o.o. made a server for company Robotina, which is installed in the NOC and serves as a communication interface. The system is flexible and allows adding mutually agreed contents to be exchanged. The server carries out the appropriate data transformation and exchange between the ICONICS/Genesis64 control system, IBM Maximo, and other information systems, integrating them into a joint information system named iNOC. Data exchange between the systems takes place in real time. 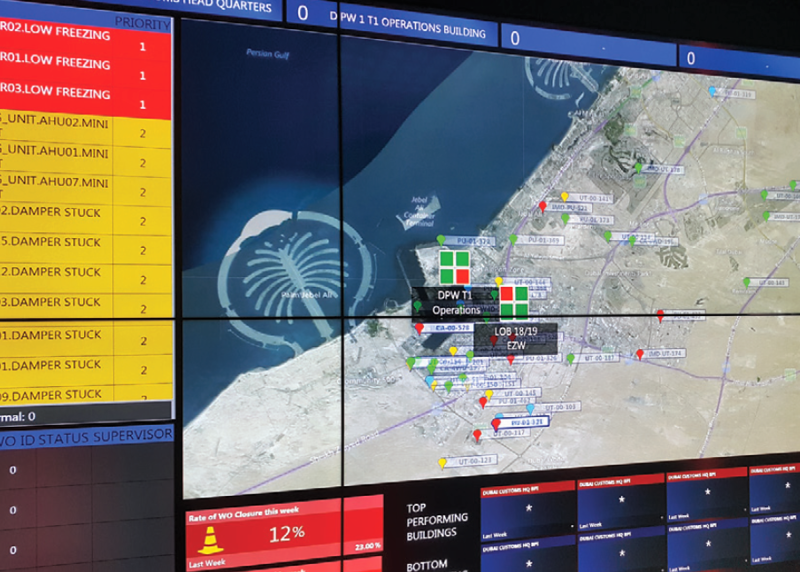 The iNOC technological solution enables the supervisors in the NOC to open their maintenance work orders in the ERP system, on the basis of alarms received from the control system. Each work order is then completed with an alarm, providing the control system with feedback. The solution drastically reduced response time of the operator to different alarms. The NOC is satisfied with the solution, which allows the introduction of additional services and connection with other systems, and is already considering new services. Consequently, we have already been developing information connections with the Vehicle Tracking System (VTS), which has an overview of the current GPS locations of all maintenance teams on the ground. On the basis of the alarm location, the system will communicate the nearest maintenance team for the newly opened work order. This connection with the VTS was also implemented in iNOC one year later.